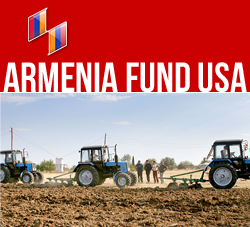 NEW YORK, New York — Within the framework of the Hayastan All-Armenian Fund’s 2013 Telethon, the fund’s Iranian affiliate has already secured US $60,000 in donations in the result of its fundraising campaign during November 26-28. The generous contributions of the Armenian-Iranian community will be used for preparation and installation of road signs along the Vardenis-Martakert Highway. Assistance of Grigor Arakelyan, ambassador of Armenia in Iran, and Archbishop Sebouh Sarkissian, prelate of the Armenian-Iranian community was instrumental in the success of the fundraising campaign.